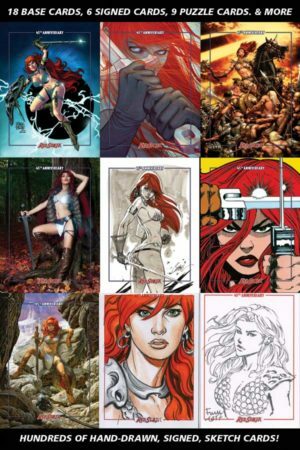 Red Sonja 45th Anniversary Deluxe Premium Trading Card Set SOLD OUT! 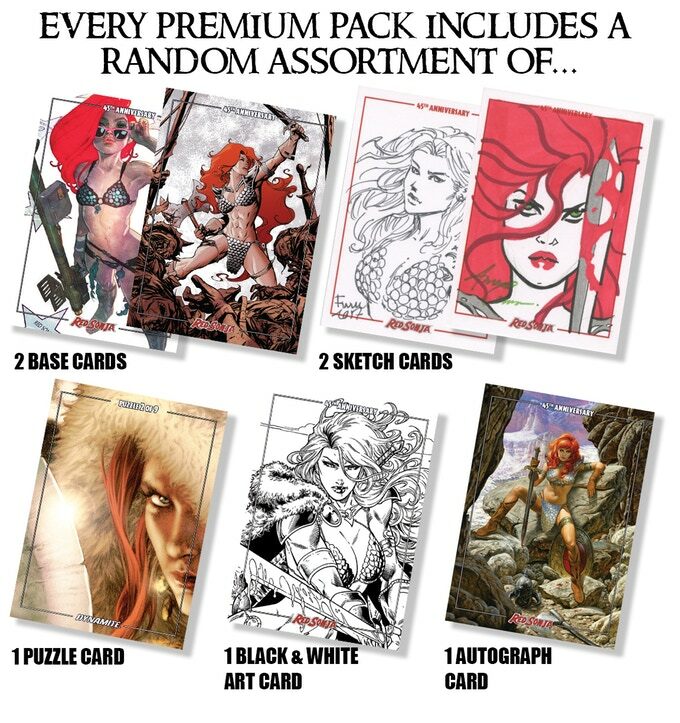 Following a very successful launch and amazing community response for Dynamite Entertainment’s premier trading card set, most distributors have sold out of the Red Sonja 45th Anniversary Collectible Card Packs with allocations through all markets. This trading card set is like no other ever created. In April, Dynamite Entertainment successfully funded a Kickstarter campaign for the Deluxe-Premiere set of trading cards featuring a select group of Red Sonja‘s most renowned artists portraying the “She-Devil with a Sword” in all of her savage, majestic beauty! The complete set includes an 18-card base, plus Dynamite chase cards that include: 6 autographed cards, 3 B&W art cards, 9-card puzzle cards, 2-box-topper special cards, and hand-drawn original art signed sketch cards. Every autographed card features a color ink or ultra-rare, gold ink signature! The Red Sonja 45th Anniversary Collectible Cards are in stores now. Collectors and fans are encouraged to call their local comic book retailers for availability.